Support operations with Superoverlay projects. You can store and load project file as XML. Operations include New (F2), Open (F3) and Save (F4). Open list of FTP connections. You can add user and password by connection. By image operations Superoverlay automatically check connection and parameters from list. Users and passwords can see from Superoverlay only. You can use this list by download source images or upload results. Amazon S3 connection and service. In first you must enter Access KeyID and Secret KeyID. In next you can upload data in S3-service. The bucket will be created automatically, if it doesn't exist. using "S3 Explorer" (add/remove buckets, generate links, upload/download files manually, Drag&Drop). You can save KML on local drive and upload with S3 explorer in next. This option can used for buffer like rasters along of roads and other line objects. Automatically open result of tiling in GE. If for you not need open images in GE then uncheck this. If checked then Superoverlay see as top level window. You can add images from the web (by URL), local network or local machine (by path). Superoverlay support now JPG, TIFF, PNG, BMP and KML Overlay formats. You can add folder into project tree. Superoverlay supports one level of folders only. Folders need for group operations with images. If we set parameter to folder then this parameter automaticaly set to all images in group. You can add images from local network or local machine (by path). Superoverlay supports multiple selections and Drag&Drop by add images. You can add images from the web (by URL). Superoverlay support now list of http and ftp URL. For add URL to list you can press button "Plus" or key Enter. Deletes selected file or folder from Superoverlay tree. Open dialogue for registration and version info. Set location of base KML file. You can use ftp address also. By ftp upload Superoverlay check parameters of connection from FTP Connections list. Specifies where the top, bottom, right, and left sides of a bounding box for the ground overlay are aligned. North(required) Specifies the latitude of the north edge of the bounding box, in decimal degrees from 0 to ±90. South (required) Specifies the latitude of the south edge of the bounding box, in decimal degrees from 0 to ±90. East(required) Specifies the longitude of the east edge of the bounding box, in decimal degrees from 0 to ±180. For overlays that overlap the meridian of 180° longitude, values can extend beyond that range. West(required) Specifies the longitude of the west edge of the bounding box, in decimal degrees from 0 to ±180. For overlays that overlap the meridian of 180° longitude, values can extend beyond that range. Rotation(optional) specifies a rotation of the overlay about its center, in degrees. Values can be ±180. The default is 0 (north). Rotations are specified in a clockwise direction. Alt (optional) specifies a altitude of the overlay. You can select units of altitude from list (m, km, ft, mi). You can set format (jpg, png, tif, bmp) and level of compression (Quality). From standard dialogue you can select transparency color for superoverlays. You can also clear the transparency color. Google Earth supports transparency for PNG format only. 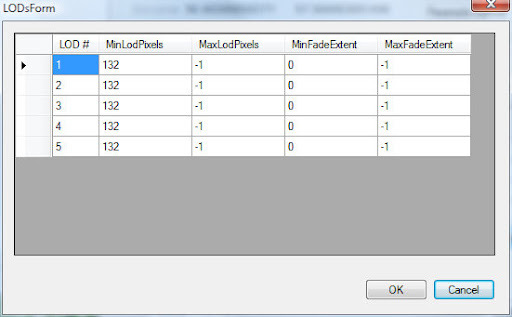 You can set method for calculation of pixel values. Create polygons with images boundaries. Make structure of links invisible to users. Level of details describes the size of the projected region on the screen that is required in order for the region to be considered "active". LOD is a base parameter of Superoverlay. This parameter defines count levels of tiling. You can select LOD for size tiled images <100kb. minLodPixels Measurement in screen pixels that represents the minimum limit of the visibility range for a given region. Google Earth calculates the size of the region when projected onto screen space. Then it computes the square root of the region's area (if, for example, the region is square and the viewpoint is directly above the region, and the region is not tilted, this measurement is equal to the width of the projected region). If this measurement falls within the limits defined by minLodPixels and maxLodPixels (and if the LatLonAltBox is in view), the region is active. If this limit is not reached, the associated geometry is considered to be too far from the user's viewpoint to be drawn. maxLodPixels Measurement in screen pixels that represents the maximum limit of the visibility range for a given region. For eath new overlay generate KML link with Extent and Fade calculation. This element defines the stacking order for the images in overlapping overlays. Overlays with higher drawOrder values are drawn on top of overlays with lower drawOrder values. By default Start draw order=0 and current drawOrder of images = level. minFadeExtent Distance over which the geometry fades, from fully opaque to fully transparent. This ramp value, expressed in screen pixels, is applied at the minimum end of the LOD (visibility) limits. maxFadeExtent Distance over which the geometry fades, from fully transparent to fully opaque. This ramp value, expressed in screen pixels, is applied at the maximum end of the LOD (visibility) limits. 6 300 - Ok - best! You can set transparency of all tiled overlays. If you check this option then results include hi-res images (last level of LOD) only. You can check this option and preview the image. You can select structure of KML, KMZ and images. Don’t pack - stores KML files and images into one folder. Pack separately - packs images and related KML files in one KML. We see the result as a set of KMZ files with embedded images. Count of KMZ files = count of tiled images. 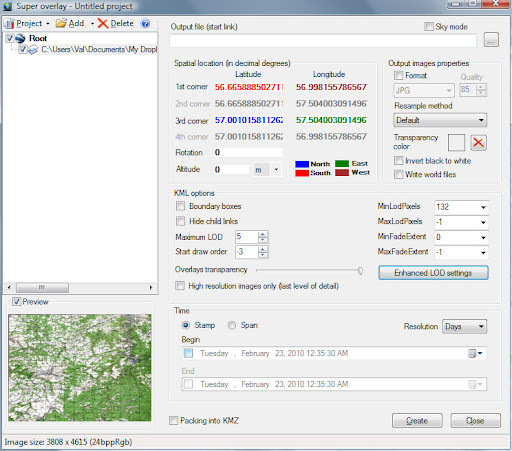 Pack into one - packs all KML files and images into one KMZ file. In status string you can see size and type of selected image. All datasets are stored in the same folder and have a relative path. Changing the images path or URL only requires changing the link to root KML. Superoverlay Pro include all features of Superoverlay Plus application and Scheduler application for run of background processes. In Scheduler you can add Superoverlay project file as task, select launch date/time and scheduling type. You can save and load the Scheduler project as XML file. Last project of Scheduler stored in registry and open by next session.